It was nearly sundown on our first day. 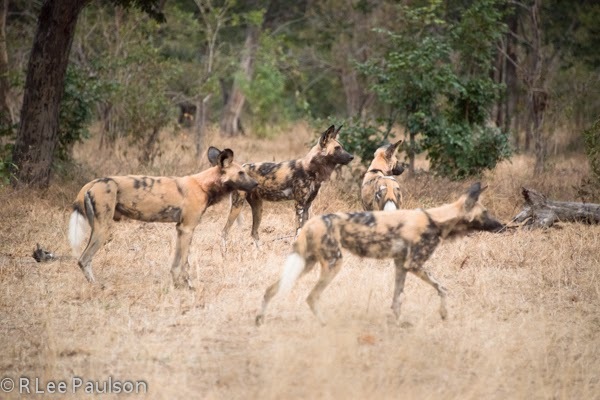 We were headed back to our game reserve lodge from the Chobe National Park entrance. On our left, we saw a bunch of what looked like dogs intently eyeing something. Our driver guide immediately pulled off the road and stopped. The object of their focus was a male lion. 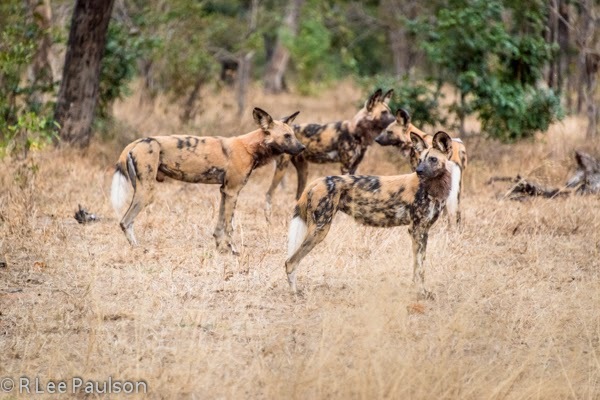 We then learned that this was a pack of wild dogs. 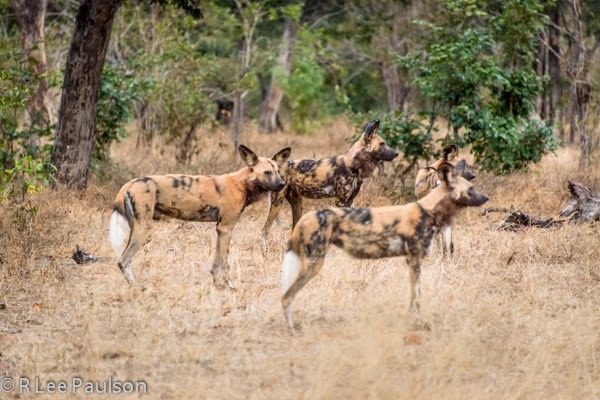 Wild dogs are some of the fiercest hunters in all of Africa. Only rarely do they fail to take down their prey. The dogs will typically surround their prey. The ones in the back bite the back leg tendons of the animal who is defending itself from dogs in the front, effectively crippling it, and bringing it down. But this lion was lucky in two ways. One, he had his brother, out of camera range, to cover his rear flank. Two, there were only about 6 dogs in the pack. We watched the confrontation for nearly 10 minutes. The dogs advanced on the lion. 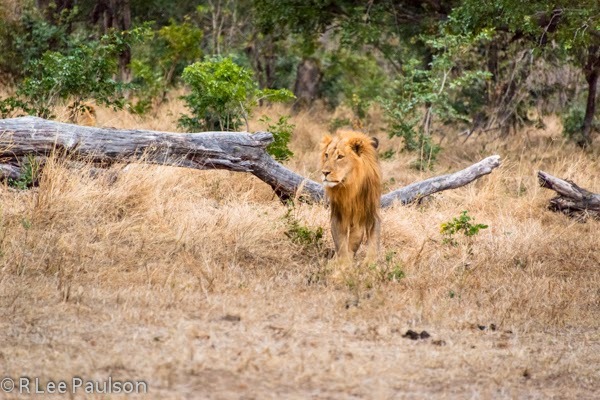 The lion responded by moving menacingly toward them. The dogs retreated. Then they regathered their courage and advanced again. 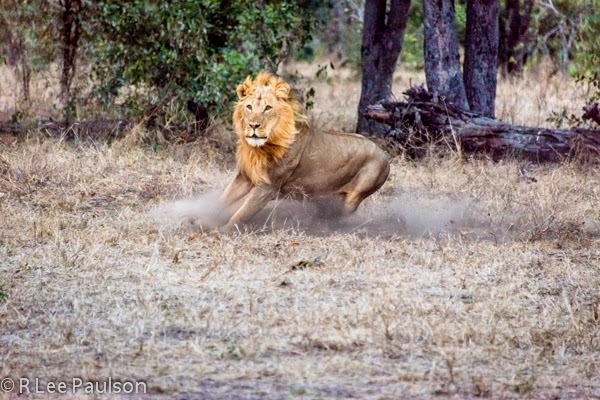 Finally, the lion made a serious charge at them. It looked for a moment as though he was seriously trying to catch one. Here, below, he has stopped his charge in a cloud of dust. That was enough to drive them away for good. 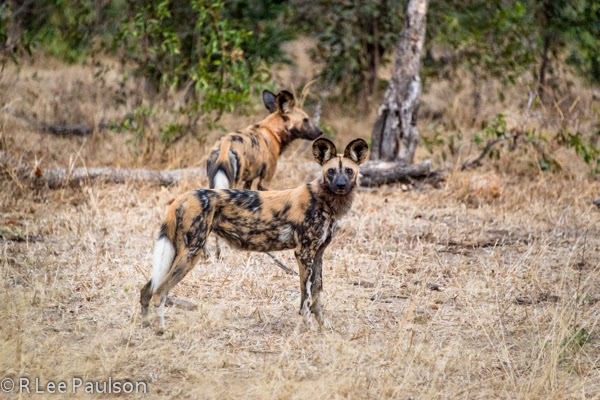 We later found out that wild dogs are a threatened species, only rarely seen in this area. They are so successful at killing the villagers' livestock that villagers all over Africa have been relentlessly poisoning them. Sometimes, I suppose, you can be too successful. Still, the lions aren't always the good guys, either. 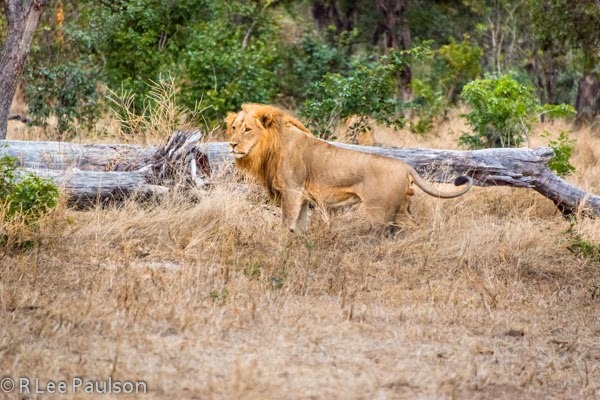 The next day we found out that these two lions killed three cattle in a village near us that night. As one Masai village chief told us, "Without the big cats, visitors like you don't come. But, we need you to come. So, we have to find a way to live with the cats and still protect our cattle." That is a continuing challenge for the villages that surround these big game reserves and parks. Next time, we come upon a lioness with a fresh kill. 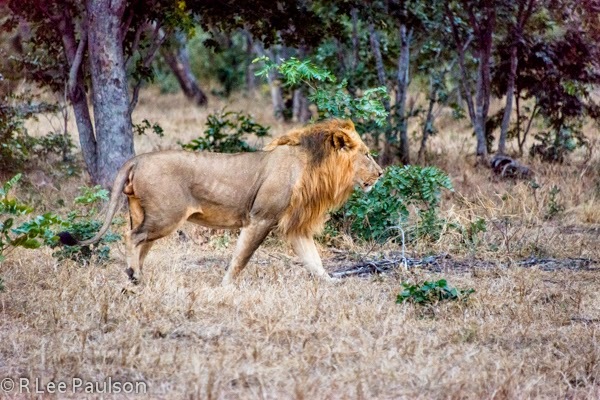 Continue on to Post 6: We Come Upon a Lioness with a Fresh Kill, by clicking here.